We all know the story of Santa Claus, who has his long list of gift requests for all the girls and boys around the world. We know he has a sleigh and his 8 (plus Rudolph) reindeer who guide that sleigh. And we know he uses his magic to deliver all those gifts in one magical night, letting children wake up to delight in them Christmas morning. But we really don’t know much about Mrs. Claus. What is she like? Is she meek? Headstrong? Fun? With my new book, Mrs. Claus Takes the Reins, I decided to explore the personality of Mrs. Claus, the woman behind the scenes who always makes sure Santa is ready for his long journey. 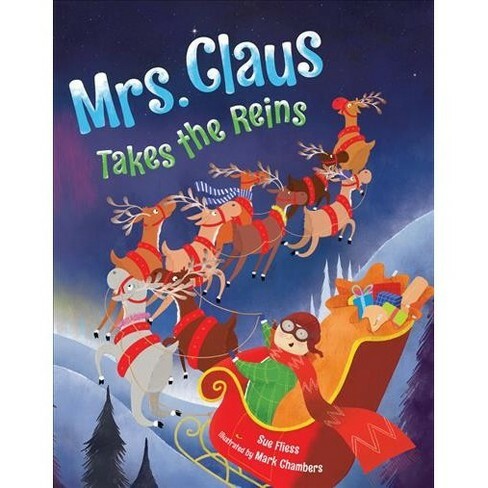 When Santa gets sick and decides Christmas must be cancelled, I thought Mrs. Claus might be just the kind of woman who could take over in a pinch, and get the job done—with the help of the elves, but really with no magic at all. And does she ever! She uses her smarts and skill and overcomes every obstacle…and even returns to the North Pole ten minutes early. Rewrite a story from a new point of view! Ask your students to choose a favorite book, then rewrite a scene from that book (or a new story altogether, if it’s a picture book), from a different character’s point of view. What if we heard the trickster magician’s side of the story in Frosty the Snowman? Or in Kate DiCamillo’s Because of Winn Dixie, wouldn’t it be fun to know what the dog is thinking? Maybe we hear Peeta’s story from the Hunger Games, or how Hagrid is feeling in a scene from Harry Potter. Encourage students to do this while they are writing original stories as well, to help develop the secondary characters in their stories. The discoveries may surprise them!